I've never been a huge fan of Halloween before, but I have to admit - this year's festivities have left me feeling positively Wiccan. In the past, Bud has shared my take-it-or-leave it Halloween attitude. There was not much about the holiday that appealed to him - the costumes, the talking to strangers, the gaggles of masked children making squealing noises. Even the candy was not a draw - for Bud, if it's not M&M's or Twizzlers, he's not particularly interested. Bud's excitement didn't really kick in until the weekend, but by Sunday he was ready to don his costume and start trick-or-treating spit-spot. We spent the next two days in a constant state of counting down and reciting each activity that would take place: Bud would bring his magician costume to school in a bag; after snack, he would put on his costume and join the costume parade around the school; then his class would have a Halloween party; after school, Nana would pick him up and take him home; after supper, Mom would come home and he would put his costume back on; then Mom and Dad and Bud would all go trick-or-treating. We also spent a great deal of time breaking down the trick-or-treating experience into its component parts: you ring the doorbell; somebody you don't know opens the door; you say "Trick or Treat"; they hold out candy; you open your bag; they put candy in the bag; you say "thank you"; we go to another house and do the whole thing again. Of course, for two days as we recited this litany together I had a silent litany of Plans B, C and D running through my head: We would bring Bud's costume to school in a bag, and give him verbal assurance that he did not have to put it on or participate in the parade or go to the party at school; after supper, Bud would decide if trick-or-treating still sounded like a good idea; if it did, Mom and Dad and Bud would drive to a house; Bud would either go to the door or not; if he went to the door, he would either speak to the resident or not; he would either get candy or not; we would either continue to another house or not. If at any point trick-or-treating seemed to Bud to be a bad idea, we would head to Dunkin Donuts and get a treat we didn't have to work quite so hard for. As it turned out, my silent litany was completely unnecessary. 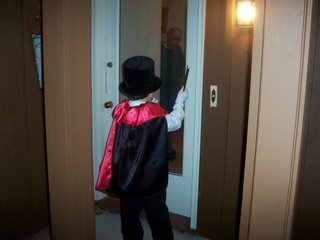 Bud was delighted when the time came to put on his top hat and cape and become The Amazing Bud. He marched in the parade. He attended the party. And he was absolutely giddy by the time I got home to pick him up for trick-or-treating. Bud, Daddy and I drove to a lovely neighborhood with houses that were fully decorated for the season. Without hesitation, Bud strutted up the long driveway of the first house with his wand held high and he pressed the doorbell with gusto. He smiled as a woman opened the door, and then - out of the blue - a small dog charged around the corner and rushed up behind her at full speed. She jumped, Bud jumped, and I thought "Dunkin Donuts, here we come." But she held the dog, and Bud held his ground. He collected his candy, thanked her, and walked away, saying "Let's go to another house." And another house, and another, and another. Ring, stranger, talk, open, thank. Ring, stranger, talk, open, thank. With each new house his confidence grew. We approached houses with cobwebs hanging, houses with spooky music playing, and even a house with a ghost that popped out of a pumpkin. Along the way we encountered pirates and gypsies and assorted other ghouls. And Bud took it all in stride. As we neared the end of the neighborhood, I realized that I hadn't thought through a Plan B for how we'd bring the evening to a close if things went well. I wondered if we were in store for a tear-filled finale when I told him it was time to go home. But Bud beat me to it, suggesting "Let's go home and have a treat! ", and Dad and I agreed that it was a great idea. I never imagined that a no-big-deal-holiday like Halloween could feel like such a significant milestone for us. It's funny. In the Celtic tradition, Halloween marks the time when we prepare for the dark months to come. I know that the calendar says that winter is approaching, and I know that it means that the days are getting shorter. But this year, for our family, Halloween felt like a step out of the darkness and like a leap into the light. I am the queen of contingency planning. And when it comes to something like that, I am happy to have my plans go awry...glad that no Dunkin' donuts were required and treats were eaten instead. Love it love it love it! Bud is a true magician!! There must be something in the air, because we had a terrific Halloween too. For one day, I felt like I had two 'typical' kids. It was amazing! three cheers for the amazing bud! we had a sweet halloween too. isn't it wonderful to see? It's amazing to me to see Meg's progression through the years-all the way from very reluctant trick or treater, to frightened of any house with decorations that were "scary", to now marching up to ANY door, liking any decorations (except maybe noisy sound effects), boldly saying "trick or treat" and "happy halloween" when leaving. Of course, she has to ask every dog owner their dog's name and what kind of dog it is, which is offputting to some. She loves to look at all the costumes and is torn between going out and staying home just so she can answer the door and hand out candy, commenting on all the costumes. This is why I adore your blog. Every parent has to deal with kids who don't want to do something the parent thinks is going to be fun for the kid. And most parents don't have contingency plans. Most parents are so attached to the idea of "fun" that we can't let it go, even when it is clear that no one is having any. Thanks for the reminder of what good parenting is all about. It's clear where some of Bud's magic comes from. I think there's something about this dressing up and being someone else for the day. My son almost literally turned into Peter Pan. Flying from house to house. We went trick-or-treating with a bunch of the kids who we often get together with. Usually he has trouble "keeping up" with them during playdates. This day, he was even ahead of the kids who were older than him. They were following him for a change. Guess Halloween really is magical. Our son actively enjoyed Halloween for the first time this year (he's almost 4). About half way through I realized how strange it feels when he does stuff normally (he has autism). We expect it out of his sister and normally have to give him special assistance. Not this Halloween. It was very strange just watching him be a kid that blended in perfectly with what was going on. We also didn't have a plan for getting him back home of things went perfectly. Fortunately, he wanted to eat his candy so the night ended very easily. Glad to hear things went so well for you, too. I had a leap into the light moment recently when M saw a joke on the television and getting it she looked me straight in the eyes to see if I got it as well. Great feeling.